Whether you’re new to the area and need a financial institution you can trust, or you’re looking for a way to keep your money local and work with a member-owned financial cooperative, EFCU is a great choice. You’ll find a wide variety of accounts for all your financial needs—whether you’re a savvy saver, a young family looking for a better auto loan rate, or opening your very first checking account. 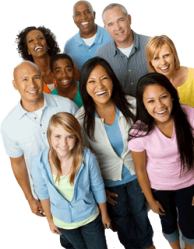 Your membership begins with your Share Savings account. Pay your $25 membership fee, and you're a member! Employees of, retired employees of, volunteers for, and elected and appointed officials of the City of Escondido. 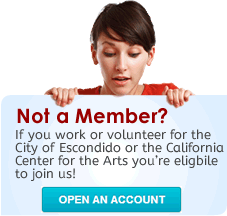 Employees of and volunteers for the California Center for the Arts, Escondido. Family members of each employee/volunteer group. Organizations of and for the membership.